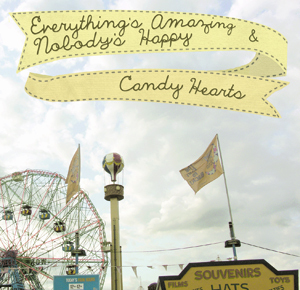 Brooklyn based Candy Hearts have announced that they have joined local label Kind Of Like Records‘ ever growing roster. The band is set to release their sophomore album and KOL debut Everything’s Amazing And Nobody’s Happy on September 27th. Self-produced and recorded by vocalist/guitar Mariel Lovel and and guitarist Kris Hayes,Everything’s Amazing And Nobody’s Happy was engineered, mixed, and mastered by Easy Plateau Productions. 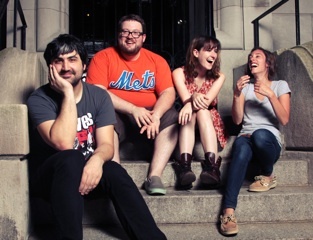 Candy Hearts have also recently announced a handful of tour dates withMixtapes, as well as a few solo shows, which includes the Kind Of Like Records Showcase on August 8 in Brooklyn, NY at The Archeron. 8/8 Brooklyn, NY – The Acheron * – Kind of Like Showcase w/ Timeshares, Direct Hit! This entry was posted on Friday, July 29th, 2011 at 5:47 pm	and tagged with Candy Hearts, kind of like records and posted in Music News, News. You can follow any responses to this entry through the RSS 2.0 feed.